If food is only what’s always on your fantasy, here it comes true with the list of these restaurants of London that don’t only serve the best of cuisines but also known among the guests for their incredible hospitality. If you are ridiculously confused with the new restaurants and cafes popping up everyday then here is a definite list of the restaurants where you should visit. These recommendations are based on the latest surveys and perfectly suitable to go for in 2015. Where some of them are easy to get seat with, others may require an advance booking, so check the status reaching their official website and act accordingly. Also, make your decision on your own by considering the price slots for the foods and drinks. 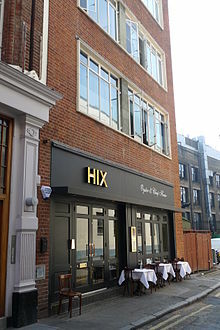 Hixter Bankside was earlier a metal box factory in Guildford Street and now has turned into a most visited restaurant. It was opened in November 2013. The area is divided into two different rooms; first one is shaped as the Parlour and other as the award-winning Mark’s Bar that also encloses the place for the private parties with the limit of almost 70 guests. The menu offers delicious British Seasonal Starters along with Large Hunks of Meat, especially designed for sharing. Before you leave the place, don’t forget to try its seasonal cocktail, available in basement. Set on the 38th floor of the Heron Tower, it’s an astonishingly stunning Japanese restaurant that boasts up the eye-catching view of the Locations across the vertiginous roof terrace of London. Here you can find a delectable selection of Ceviche and Sushi. If you are not able to push your boat out then try out the buttery Kobe beef. It’s really awesome. If you are in love with the Scottish food, then Boisdale may bring you closer to your fantasy since it offers widest gamut of Scottish cooking including the fresh oysters and the great selection of whisky. To enjoy a true Caledonian party, visit here on their Jazzy Nights and enjoy the best of Scottish delicacy. When it comes to the quirkiest restaurants in London, Bunga Bunga or “An Englishman’s Italian” is the place to visit on. Here interior is superbly creative with the Gandola Shaped Bar, bicycles hanging around from the ceiling. It’s dedicated to the Silvio Berlusconi, who is a former three-time president of Italy and an outstanding media tycoon. Its wild karaoke nights are what make it worth visiting. Located on the tranquil Devonshire Square, with just three minutes of distance from the charming beauty of Bishopsgate, Cinnamon Kitchen is a wonderful contemporary restaurant. Let’s reach there, sit on a sundrenched afternoon and delight in the luscious re-interpretations of the famous recipes of India including- Chicken Biryani, Tandoori Red Deer, and Kerala’s spiced sea breem.